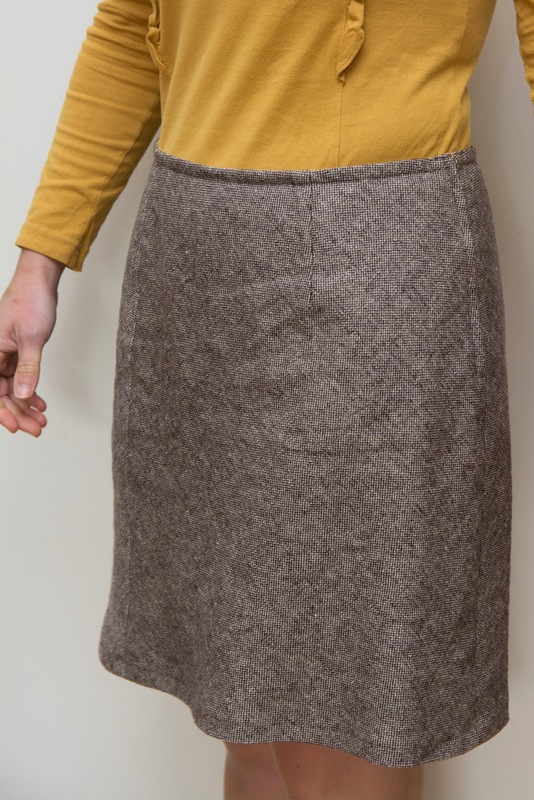 It's the Continental skirt by Lisette, in a straight size 18. I'd found this little remnant of a DKNY cotton/linen tweed at The Fabric Store and stashed it away thinking it would make jacket for A. I seem to be raiding the supply of potential jackets-for-A fabrics a lot lately. Hopefully she'll forgive me as this fabric is just too nice! The pattern pieces are cut on the bias so it's pretty economical in terms of how much fabric is required. The awesome aspect of it being cut on the bias is the freedom of movement you get. Normally I wouldn't look twice at a straight skirt as I doubt I'd be able to ride my bike, or just do day to day stuff in such a fitted skirt. The genius bias cutting gives it a great curve over your backside, a little bit of a tulip shape, and allows you to do this!!! When an elegant looking skirt allows you to be as un-elegant as that, I say, that's a pattern to make over and over again. It has been bicycle commute to school tested and it's perfect. I'm a bit of a novice when it comes to adjusting patterns for any kind of decent fit, and I wanted to get it right before chopping my designer remnant. I'm also notoriously fussy (too many examples to provide links to them all!) and I wanted this skirt to be lined. I figured the perfect solution would be to cut the lining in some cheap thin voile from the stash, make the adjustments to fit, use the lining as a muslin and then as the lining itself. It turned out the size 18 was perfect and I didn't need to change a thing (phew!). the twill tape finish of the waistband is a really nice touch and I'm sure it would be perfectly nice without lining. But I'm happy to have lined it, although this one is a bit sticky with tights as the lining is cotton. I'm sure in springtime with bare legs, the cotton lining and the linen/cotton skirt will feel fantastic. And finally, here's the photobombing kids finding it hilarious helping me with my posing! 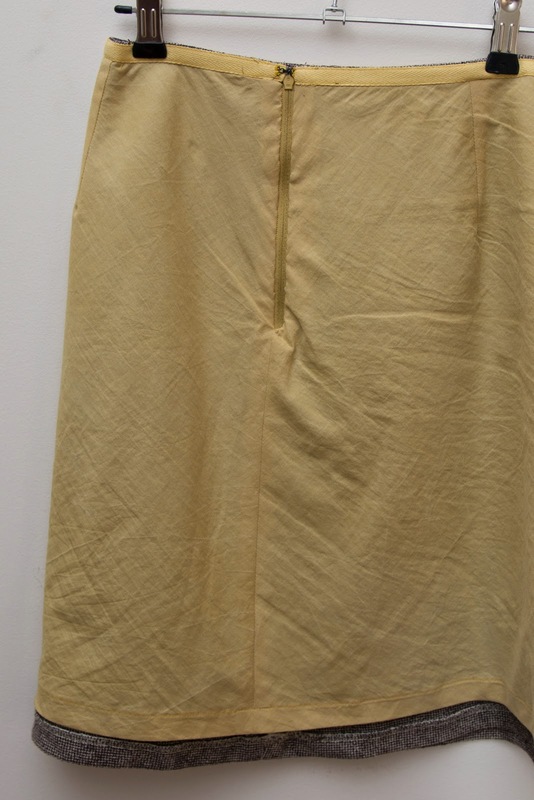 The skirt is lovely and looks great with your mustard tee. In my head it was going to be high, and straight, and easy... Funny how our bodies change hey?.. Glad to hear you and Beatrix are doing well. This looks like a great pattern - like you say, smart & practical. Nicole's recent childbirth comment made me laugh! Thanks Suzy. It is a lovely skirt pattern. Doubly so for just happening to fit me with no changes! It's lovely and looks like it'd be perfect for a weekend or workday. Thanks for sharing! Thank you Agnes! I appreciate your comment. You know I thought of you with this one as it seems to be another thing that I've made that would suit your work wardrobe! Okay, you completely crack me up with that leg action. The skirt is pretty rad, too. Not just a description of the construction, the fit and the instructions but a bike-ability-score too! That is a nice looking skirt. And some killer moves to boot! It turned out really nice, lining it will be totally worth it in bare leg season. Is it terrible I think I might have this pattern? ?but I'm really not sure...must go look now!! The skirt looks fab, Shelley! 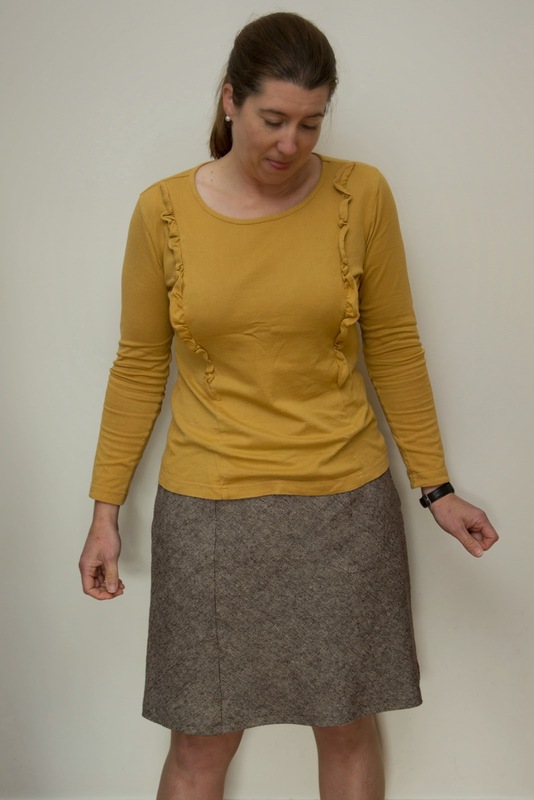 I didn't realize that skirt was cut on the bias (if I'd bothered to read the description I would have...doh!). Yay, found your post -- and I love how it is chic yet perfect for busting a move in! I was distraught when I saw that the pattern is not available anymore, but would you know it, the pattern hoarder that I am I bought it ages ago and put it aside for "when I learn to sew properly." Phew! Thanks for directing me here! That's fantastic Emi. Yay for pattern hoarding!